Product Detail Summary: Extensive training in barren conditions makes the Desert Troopers the perfect soldiers for desert combat. 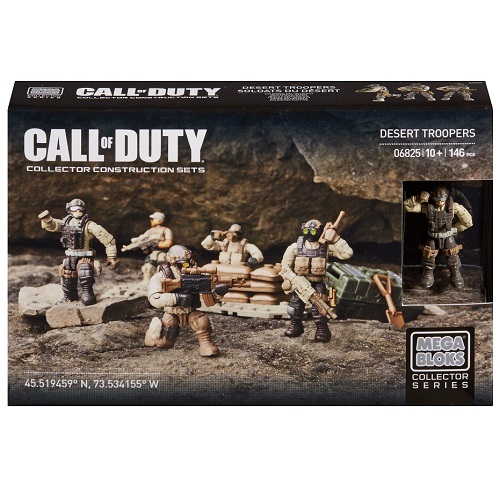 Positioned on a small buildable arid-themed terrain, each of the five micro action figures possesses extreme poseability in practically any combat scenario. Authentic in-game accessories include desert camouflage uniforms, removable combat vests, binoculars, canteen, and more, that allow for mission-specific customization. • Includes 44 highly detailed, interchangeable accessories and weapons like removable combat vests, entrenching tool (E-Tool), canteen, binoculars, sandbags, combat knives, riot shield and more!